Villa Georgios Rafaela is an impressive, single storey stone build villa, located in Goudi, a few minutes drive from Polis or Latchi, in an orange grove, with amazing surroundings and pretty local wildlife. The property features a wonderful garden with plants and herbs, an inviting swimming pool with dining al fresco facilities next to it, children's playground and it has been noted as the ideal place for a family or party of 9 people who would wish to have a memorable holiday in a private oasis with peace and seclusion. Villa Georgios Rafaela is all set on one level and it is accessed by a private driveway, which joins the village road with its extensive and private secluded grounds. The front door opens into a spacious, airy, open plan space where a lounge, a dining area and a modern kitchen are nicely fitted. A small joining corridor leads to the bedrooms. On the left hand side is a modern cloakroom and a double bedroom just opposite, with an en-suite jacuzzi shower. Next on the right, is a king sized bedroom with an adjacent family bathroom, another single bedroom good for teenagers seeking their own privacy and next to it the fourth bedroom, which is a twin one, sharing the family bathroom. At the far end is the last but not least master bedroom, with a nicely designed en-suite shower room. 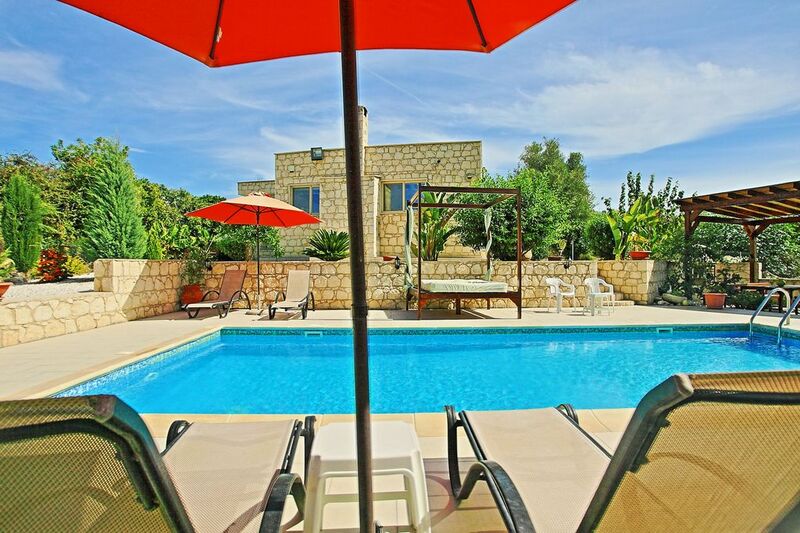 The villa is fully air-conditioned (a small use fee must be paid locally per unit and per day), provides all the facilities for a large group and it has been reported exceptional for its privacy, location, al fresco facilities, peace and seclusion, not far from Goudi village centre. ovely clean villa in a beautiful location. We really enjoyed our stayed in the villa. We really enjoyed our stayed in the villa. The place was very very clean, the pool was great - just right for us and the children (not too deep or shallow, big enough). The beach towels were a nice bonus. Location is good - very private but 5 minute drive from the Pollis with supermarkets and restaurants. Please note the following: 1- As stated in the small letters on the website - plan ahead for adding aircon payment. We stayed for 5 days in mid-August, and the place was really hot, so we ended up paying 150 euros more for the aircon (6 units * 5 days * 5 euros). 2- We had multiple WiFi issues - the download speed is super-slow, so only basic massages can get through. No non-WiFI internet reception available on site. So.. no games, movies or emails for five days was a bit of challenge for the kids (and us..). 3- Be aware there are bedding arrangements for only 9 people, while our booking was approved for 10 people. Also, one of the rooms (with a double bed) is mostly unshaded so morning light will wake you and the kids up early. 4- While the host's daughter came to welcome us, communication was partial with the hosts themselves, and some of our problems went through the Eos office. This was frustrating for us. Great stay at Villa Georgios Rafaela in Goudi. Great stay at Villa Georgios Rafaela in Goudi. While entering the narrow road that leads to the villa may seem a bit isolated, as soon as you reach the house, you know you are going to have an amazing time. Secluded, private, right in the middle of an orcahrd and surrounded by lush greenery. The owner was always avaialable whenever he was needed and we were also greeted with a welcoming pachage including edibles already in the fridge. Perfect for families with kids (spent all day in the pool or at the play area next to the pool) or a big group of firends for relaxation. Really enjoyed it.